Pride gets something of a bad rap; to many it can be considered both good and bad. Having self-respect and satisfaction in one’s achievements are good; being haughty, boastful or arrogant about one’s self is not. Hence, pride vs. vanity. We may take pride in family, work, loyalty, creativity. We may also take pride in ourselves – who we are and the things for which we stand. 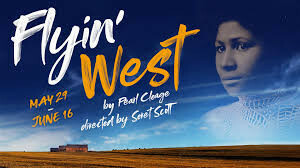 In playwright Pearl Cleage’s incredibly powerful story, Flyin’ West, it is clear what underlies her very colorful (pun intended) characters’ sense of selves – for some it’s pride, in the best sense; for others, vanity or pride at its worst. What is of the utmost importance to the majority, however, is pride in their ethnic identities, in that they recognize fully that is has served to shape both where they’ve been and their dreams yet to come. It is this shared heritage which bolsters each character’s individual identity, their strengths, as well as their collective soul. 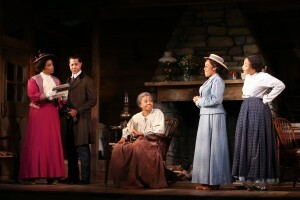 As the play opens, we discover a unique and eclectic “family” (some who are related by blood and some by choice) – Sophie Washington, Fannie Dove, and Miss Leah – three strong and independent black women who are homesteaders living just outside the town of Nicodemus, Kansas in 1898. Unmarried and in their thirties, Sophie and Fannie work hard and take pride in themselves, their heritage, and their relatively newfound freedom. They live with matriarch Miss Leah, a former slave, who bore ten children who were sold to slavery; she then lost five more who were born in freedom who later died. She is feisty, strong, and independent, despite her slowly growing dependence on the younger women. The women are graced with a visit from their youngest sister, Minnie Dove Charles, and her biracial husband, Frank Charles, who reside in London; and life on the homestead is sorely disrupted. Sophie and Fannie soon learn that Minnie isn’t in the happy marriage she would have everyone believe. And the reason for their visit, the death of Frank’s white father, turns sour when he is ultimately disowned by his white brothers and both his inheritance and familial ties are severed. Frank’s foul temper and excessive vanity (including his need to be perceived as white), become matters of contention with Sophie, who never liked him from the start. All each of the women truly want is their independence and the opportunity to fully engage in the lives that are now due them and to all blacks in America. They want to keep the land that they own and build a stronger, cohesive, and flourishing black community. But if Minnie’s husband has his way, a bleaker future will be before them. In stark contrast to the empty and callous Frank, is Fannie’s suitor, Wil Parish, a hardworking, devoted man who not only respects the women, but will do anything to protect them. Transcending cultures and backgrounds, Flyin’ West demonstrates the importance of not just pride in self, but also the freedom to become one’s best self. It is a story of family, love, support, and shared values. In addition, it emphasizes how we must protect and preserve what is essential to our livelihood. And finally, female empowerment is a compelling and predominant theme. As a Connecticut resident for nearly all my life, I’m delighted to know that we are a state rife with outstanding theatrical venues with thought-provoking, top-quality productions right in our own backyards. Westport Country Playhouse never disappoints – and this production of Flyin’ West is no exception. The performances by every member of the cast are truly sublime. They deliver Cleage’s story with warmth, intelligence, humor, and compassion. Flyin’ West is a stellar piece of writing whose narrative flow is altogether engrossing, drawing you in and demanding that you care about each one of her well-crafted characters. Expertly directed by Seret Scott, she guides the cast in asserting the power of the female into every poignant moment – an essential element in Cleage’s decades old words which mirror the landscape of today’s entertainment world. Brilliant performances are delivered (in order of appearance) by Brittany Bradford as eternally positive, appeasing Fannie; Michael Chenevert as the duplicitous and detestable Frank; Nikiya Mathis as strong but at times caustic Sophie; Brenda Pressley as strong-minded, storytelling Miss Leah; Keona Welch as the loving but weak-hearted Minnie; and Edward O’Blenis as the fiercely protective Wil. 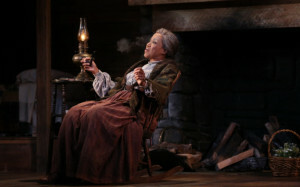 The truly stunning scenic design by Marjorie Bradley Kellogg is a sight to behold – it is a set that is honest and true to the words Cleage lay upon the pages, evocative of time and place. Heidi Leigh Hanson’s costume design is also outstanding. Kudos to Stephen Strawbridge for lighting design; to Frederick Kennedy for sound design; to Michael Rossmy for fight direction; to J. Jared Janas for wig, hair and makeup design; to Alice M. Pollitt as Production Stage Manager; and to Tara Rubin Casting, Laura Schutzel, CSA. Flyin’ West is intense and beautiful, stunning and surprising. But don’t just take my word(s) for it – you won’t want to miss this magnificent production. Spoiler alert: Reviewer confession. Since my wife, creative partner, and co-reviewer maintains our busy and hectic schedule of events, unless Shakespeare is in the title or it’s a famous play like West Side Story, I generally do not know anything about what we are going to see at the theatre (which is completely different than when we see a movie where I have to know every spoiler in advance – much to the chagrin of my wife). So, when I heard on the car ride to Westport that we were going to see a play called Flyin’ West, my oft-times sophomoric mind immediately conjured up Hope and Crosby “Road” pictures (obviously before my time). When she read me the log-line synopsis stating that it was about four independent, pioneering women struggling to survive in the early days of westward expansion, I thought of Little House on the Prairie sans Michael Landon (which was not before my time). Well, it could not have been further from the truth. Do not let the title or blurbs out of context deceive you. Westport Country Playhouse’s production of Flyin’ West is an engaging, thought-provoking, edge-of-your-seat exploration into the indominable human spirit. 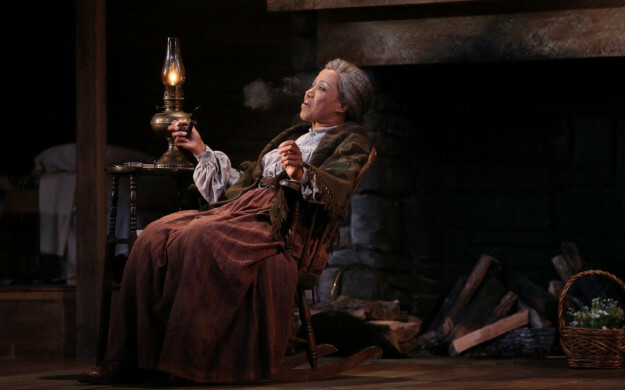 The play takes place just after slavery was abolished and African American settlements were sprouting up in the wake of westward expansion. Three women of color who are free and able to own property have settled into one of these settlements known as Nicodemus, Kansas. The matriarch, Miss Leah, has more or less adopted two grown sisters, Fannie Dove and Minnie Dove Charles, and another woman, Sophie Washington. With the exception of the Dove sisters, the absence of blood ties does not make this core group any less of a genuine, loving family proving that genetics are only part of our individual make-up; nurture (as opposed to nature) can be just as powerful, if not more so, in our developmental process. The proverbial wrench gums up the relative peace and serenity the women have found when Minnie Dove Charles brings her new husband, Frank Charles, home to meet the fam. It seems Frank, a mulatto (a word in vogue at the time, but biracial is more appropriate today), who can pass for white, has led the good life, living off his father’s allowance (who had accepted him as part of the family) and spending time in England. He is vociferous in his distaste for “colored” people and a settlement like Nicodemus. When his father dies and his half-brothers nix Frank’s share of the inheritance, familial discord arises and we discover that Frank is both an emotionally and physically abusive husband. Without giving away any spoilers, the second act packs a wallop as and Frank gets his just desserts (pun intended). While the play as whole is mesmerizing, the second act really hits home and is almost Hitchcockian in nature. The writing and research by Pearl Cleage, the direction by Seret Scott, and the acting by the entire cast are masterful. We are immediately caught up in the lives of these women and men, their struggles and their will to survive no matter what. Like Tara being the power base for Scarlett O’Hara, the ownership of land for people who were once slaves becomes both the glue and the driving force to survive and forge their own identities. Kudos must go to the entire cast whose acting was simply flawless: Brittany Bradford (Fannie Dove), Michael Chenevert (Frank Charles), Nikiya Mathis (Sophie Washington), Brenda Pressley (Miss Leah), Keona Welch (Minnie Dove Charles) and last, but not least, Edward O’Blenis (Wil Parish). While all the performances are top shelf, special shout-outs must go to Brenda Pressley and Michael Chenevert. Ms. Pressley is stunning as the matriarch of the ad hoc clan of women, bringing an authenticity to the role of a woman who has seen it all, done it all, faced insurmountable odds, faced incredible pain and loss (watching her ten children being sold off to other plantations), and yet still conveying a sense of hope and search for meaning in this vita luna. It is not a spoiler to say that Michael Chenevert is a dastardly villain, for we learn early his prejudices and his emotional and physical abuse of his wife. Nevertheless, via subtle speeches evincing his personality, he does convey a vulnerability; a person torn between two worlds, having a foot in each, but never belonging to any one place fully. Mr. Chenervert’s performance stirred memories of the still haunting and poignant 1959 film, Imitation of Life, where one of the characters disinherits her loving black mother and passes herself off as white most of her life only to realize at the end that it is not what we are, but rather who we are as individuals. Westport’s Flyin’ West is an amazing theatrical experience that cannot and should not be missed!